The role for which he is most remembered today was as a night-time messenger on horseback just before the battles of Lexington and Concord. 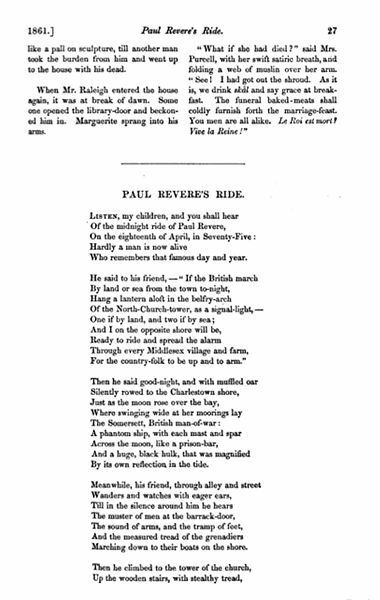 His famous "Midnight Ride" occurred on the night of April 18/April 19, 1775, when he and William Dawes were instructed by Dr. Joseph Warren to ride from Boston to Lexington to warn John Hancock and Samuel Adams of the movements of the British Army, which was beginning a march from Boston to Lexington, ostensibly to arrest Hancock and Adams and seize the weapons stores in Concord. The British army (the King's "regulars") had been stationed in Boston since the ports were closed in the wake of the Boston Tea Party, and was under constant surveillance by Revere and other patriots as word began to spread that they were planning a move. On the night of April 18, 1775, the army began its move across the Charles River toward Lexington, and the Sons of Liberty immediately went into action. At about 11 pm, Revere was sent by Dr. Warren across the Charles River to Charlestown, on the opposite shore, where he could begin a ride to Lexington, while Dawes was sent the long way around, via the Boston Neck and the land route to Lexington. In the days before April 18, Revere had instructed Robert Newman, the sexton of the Old North Church, to send a signal by lantern to alert colonists in Charlestown as to the movements of the troops when the information became known. One lantern in the steeple would signal the army's choice of the land route, while two lanterns would signal the route "by water" across the Charles River. This was done to get the message through to Charlestown in the event that both Revere and Dawes were captured. Newman and Captain John Pulling momentarily held two lanterns in the Old North Church as Revere himself set out on his ride, to indicate that the British soldiers were in fact crossing the Charles River that night. Revere rode a horse lent to him by John Larkin, Deacon of the Old North Church. Riding through present-day Somerville, Medford, and Arlington, Revere warned patriots along his route - many of whom set out on horseback to deliver warnings of their own. By the end of the night there were probably as many as 40 riders throughout Middlesex County carrying the news of the army's advancement. Revere did not shout the famous phrase later attributed to him ("The British are coming! "), largely because the mission depended on secrecy and the countryside was filled with British army patrols; also, most colonial residents at the time considered themselves British as they were all legally British subjects. Revere's warning, according to eyewitness accounts of the ride and Revere's own descriptions, was "The Regulars are coming out." Revere arrived in Lexington around midnight, with Dawes arriving about a half hour later. Samuel Adams and John Hancock were spending the night at the Hancock-Clarke House in Lexington, and they spent a great deal of time discussing plans of action upon receiving the news. 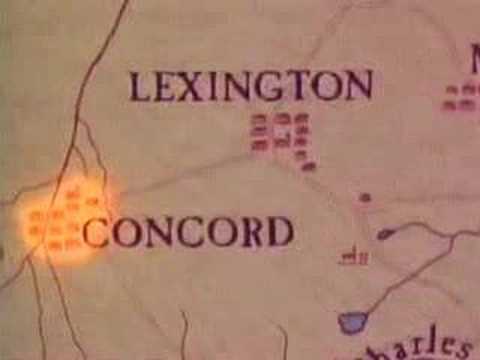 Revere and Dawes, meanwhile, decided to ride on toward Concord, where the militia's arsenal was hidden. They were joined by Samuel Prescott, a doctor who happened to be in Lexington "returning from a lady friend's house at the awkward hour of 1 a.m."
Revere, Dawes, and Prescott were detained by British troops in Lincoln at a roadblock on the way to Concord. Prescott jumped his horse over a wall and escaped into the woods; Dawes also escaped, though soon after he fell off his horse and did not complete the ride. Revere was detained and questioned and then escorted at gunpoint by three British officers back toward Lexington. 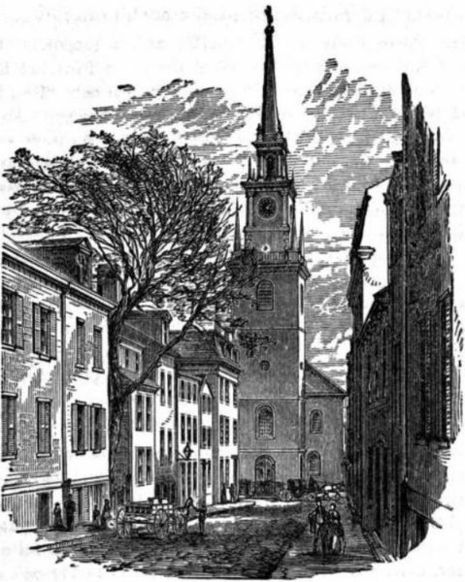 As morning broke and they neared Lexington Meeting-house, shots were heard. The British officers became alarmed, confiscated Revere's horse, and rode toward the Meeting-house. Revere was horseless and walked through a cemetery and pastures until he came to Rev. Clarke's house where Hancock and Adams were staying. As the battle on Lexington Green continued, Revere helped John Hancock and his family escape from Lexington with their possessions, including a trunk of Hancock's papers. The warning delivered by the three riders successfully allowed the militia to repel the British troops in Concord, who were harried by guerrilla fire along the road back to Boston. Prescott knew the countryside well even in the dark, and arrived at Concord in time to warn the people there. An interactive map showing the routes taken by Revere, Dawes, and Prescott is available at the Paul Revere House website.